Two articles in The New York Times point to the importance of maps and mobile services this week. 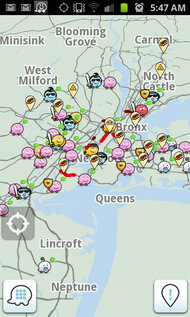 A screen shot of the Android version of Waze, a social mapping service used by millions of drivers around the world. David Pogue reviews the new Google Maps app for the iPhone for The New York Times today. 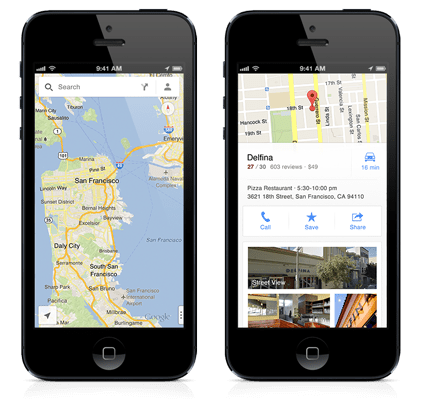 Readers of GISCafe Voice might remember Apple dropped their long time relationship with Google in order to provide their own Apple Maps, which some customers have not found as good as Google Maps. On Monday Apple introduced a new version of its mobile operating system for iPhones and iPads that will bring a host of new features, including maps that let users soar over a three-dimensional rendering of a city, according to an article in The New York Times. As was mentioned in this blog of a pre-announcement of Google Earth for mobile “(Pre-announcement of Google Earth for mobile made at Google event”) last week, the new map software replaces Google data with Apple’s own mapping system. This is a big step for a company that has considered Google a close partner up until now. Since Apple introduced the iPhone, it has relied on Google data to drive the mapping software. When Google released its Android platform, however, relationships between the two companies began to disintegrate. Not surprisingly as Android is the top mobile operating system in the world, putting Apple and Google head to head in several different markets. WASHINGTON — Law enforcement tracking of cellphones, once the province mainly of federal agents, has become a powerful and widely used surveillance tool for local police officials, with hundreds of departments, large and small, often using it aggressively with little or no court oversight, documents show. The practice has become big business for cellphone companies, too, with a handful of carriers marketing a catalog of “surveillance fees” to police departments to determine a suspect’s location, trace phone calls and texts or provide other services. Some departments log dozens of traces a month for both emergencies and routine investigations. Good map depicted the Iowa Republican Caucuses and how each county voted in The New York Times. You can filter data by demographics, median income, other (such as college education), and who won in 2008.